The two Cabinet members – but not the CIA director – speak to senators as a vote looms on a military aid package that might scale back support for the kingdom. Two members of President Trump’s Cabinet on Wednesday strongly defended continuing U.S. backing for Saudi Arabia in the war it is leading in Yemen, despite the brutal murder of a Saudi journalist and a humanitarian crisis that has pushed Yemen to the brink of famine. Secretary of State Mike Pompeo and Defense Secretary Jim Mattis appeared in a closed-door meeting with senators before an anticipated vote on whether to dramatically scale back U.S. military support for the kingdom. 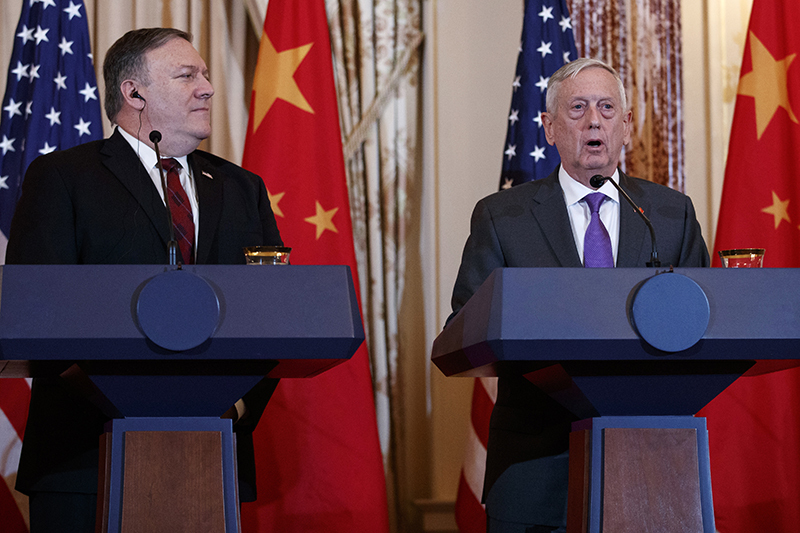 Their opening remarks, released by the State Department and the Pentagon, were a case study in the difficult challenge of balancing perceived U.S. security needs against a partnership with a government that has engaged in behavior that has drawn international condemnation. Among the outcomes Pompeo predicted are more civilian deaths without U.S. training for targeting, more safe havens for terrorists and more danger for oil tankers in the Red Sea and Americans landing at the Riyadh airport, which has been a target of missiles fired by Iranian-backed Houthi rebels in Yemen. Pompeo’s remarks echoed points he made in an opinion piece in the Wall Street Journal on Wednesday, in which he characterized the reaction to the October murder of Washington Post contributor Jamal Khashoggi as heightening “Capitol Hill caterwauling and media pile on.” Pompeo did not mention Khashoggi in his prepared remarks to senators. Mattis lamented the journalist’s killing while underscoring the need to continue a partnership with Saudi Arabia even as the airstrikes have killed tens of thousands of people, both civilians and rebels. Pompeo said it would be “misguided” to pull back what he characterized as limited U.S. military support and weapons sales to the Saudis on the eve of potentially promising peace negotiations led by the United Nations. In addition to Saudi Arabia’s “strategic” importance in the Middle East, President Trump has repeatedly cited its purchase of U.S. weapons and help in keeping oil prices low as important to the U.S. economy. As pressure to reduce U.S. military ties with the Saudis has increased, however, Riyadh has emphasized that it has other options, including with Russia. Relations with Moscow have tightened markedly in recent months, with Saudi Arabia continuing to express interest in the purchase of a sophisticated Russian missile defense system and indicating that, despite Trump’s entreaties, it may cut oil production to boost world prices. Oil is among the subjects Crown Prince Mohammed bin Salman, who U.S. intelligence has concluded likely ordered Khashoggi’s killing, is expected to discuss with Russian President Vladimir Putin at the G-20 summit in Argentina later this week, the Kremlin said Wednesday in confirming that Mohammed and Putin will hold a bilateral meeting there. Trump, who will also attend the summit, will meet with Putin as well. He has said he would be willing to meet with Mohammed but currently has no meeting scheduled. Mohammed, following a tour of Arab countries over the past week, arrived in Buenos Aires Wednesday morning. Many senators had predicted Wednesday’s meeting with Pompeo and Mattis would be unsatisfactory, as the administration did not send CIA Director Gina Haspel to speak about the CIA assessment that Saudi Crown Prince Mohammed bin Salman ordered Khashoggi’s killing. Trump has dismissed the CIA’s assessment as inconclusive “feelings” – prompting backlash from the Republicans’ most senior ranks. A bipartisan group of senators has proposed a spectrum of sanctions focused against the Saudi-led coalition and any other entity fomenting unrest in Yemen. Their bill would also curtail most weapons transfers to Saudi Arabia until the coalition pulls back from its Yemen campaign. But senior GOP leaders have yet to embrace the legislation, which stands little chance of passing Congress unless it’s inserted into a must-pass spending bill, due Dec. 7. Another bipartisan group is hoping to deliver a more immediate rebuke of Saudi Arabia’s methods with a resolution to invoke the War Powers Act and force the United States to end its military, intelligence and air support for the Saudi-led coalition. A similar effort in March failed to garner enough votes to proceed, but sponsors believe the Khashoggi slaying inspired several more senators to stop prioritizing the strategic alliance with Saudi Arabia over its human rights record. Sen. Cory Gardner, R-Colo., said “it would be nice” had Haspel been included in Wednesday’s briefing for lawmakers. “There are certainly members who are weighing the absence of the CIA director in how they will vote,” he said. “I don’t think the administration won any votes, won over any troubled Republicans in that briefing,” Sen. Chris Murphy, D-Conn., said, saying he was “more confident” after the briefing that the resolution would have enough votes to pass. Senate Foreign Relations Committee ranking member Robert Menendez, D-N.J., who previously voted against ending U.S. participation in the Saudi-led coalition on security grounds, said this week that he would vote to support the resolution now. Sen. Bob Corker, R-Tenn., the committee’s chairman, has hinted he might do the same. Similar legislation has already been stymied by House Republican leaders, who earlier this month inserted a rule change into a bill that nullified expedited procedures under the War Powers Act that lawmakers needed to push their Yemen resolution to the floor. On Wednesday, House Speaker Paul D. Ryan, R-Wis., directly avoided putting blame on Saudi Arabia for Khashoggi’s murder or assigning them any responsibility for the deteriorating humanitarian situation in Yemen. The administration has yet to promise House lawmakers a briefing on Yemen and Saudi Arabia, according to both Republican and Democratic aides. Corker, Menendez, Sen. Lindsey O. Graham, R-S.C., and several others had called for the administration to allow a top intelligence official to join the briefing. On Tuesday, Sens. Ron Wyden, D-Ore., Martin Heinrich, D-N.M., and Jack Reed, D-R.I., filed a bill to force the intelligence community to release a public report detailing who ordered Khashoggi’s killing. “The American people deserve to know the truth,” Reed said in a statement. Earlier this month, Corker and Menendez also invoked their authority under the Global Magnitsky Act, under which the United States may sanction foreign officials over human rights abuses, to force Trump to say whether Mohammed bore responsibility for Khashoggi’s murder.